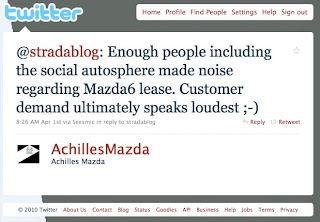 The Auto Marketing Blog: Did Mazda Canada Start Leasing Due to Twitter? Tino Rossini is very interesting person I have come to know through social media. He is part of an automotive blog based in Canada called Strada: Energize Your Automotive Experience. The blog covers a lot of aspects common to most automotive blogs: reviews, thoughts on the industry, some motor-sports but what makes this blog a bit more unique is Tino who is a retiree with a lot of interesting perspectives and historical knowledge of the industry and also someone very engaged in social media. Why am I sharing all this on an automotive marketing blog? 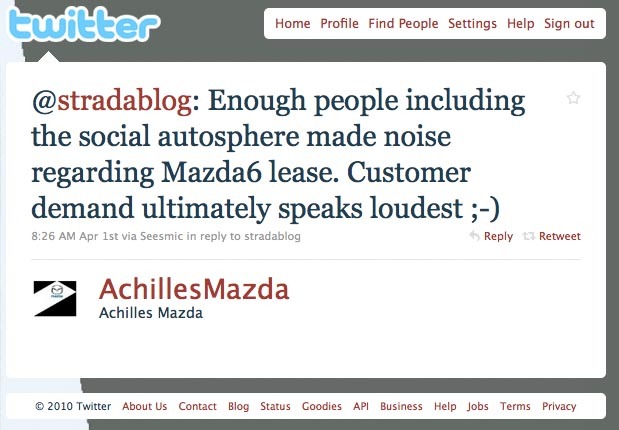 Well this morning Tino shared with me a post on his blog that shared an example of how a brand (@MazdaCanada), a dealership (@AchillesMazda), a user forum (@MazdaForums) and an automotive blogger (@stradablog) all conversed on a review of a Mazda 6 that possibly contributed to Mazda Canada offering leasing on the 6, which it wasn't doing until shortly after some exchanges on Twitter. All of this could've just been coincidence, but it is an interesting tale and probably had some impact on the decision. Read the article here for the full story. This is interesting because it demonstrates a couple things 1) how brands are engaging online 2) how dealerships are actively participating 3) how forums are getting outside of message boards and on to Twitter 4) how social media can impact marketing sales strategy.